First of all this guide is not intended for professional photographers, who with years of experience will have their own preferred settings. Many of the camera users I know, including those I spot at weddings taking pictures have their cameras permanently stuck in auto mode. I am not knocking auto mode because a lot of knowledge and electronic wizardry has gone into making this a “best fit” option for many photographers. I just wanted to let you know how you can use some of the other settings to perhaps take an even better picture. TV – Shutter Priority. When you select this mode, you are telling the camera which speed to use, the electronics in the camera then work out the best aperture for a perfect exposure. So why is shutter speed important? If you are taking pictures of motor cars racing, or your children running in the park, if you have a fast shutter speed you are more likely to stop the action perfectly. If you had a slow shutter speed then you would find that the cars were blurry and perhaps the arms and legs of your children. “At a wedding” – I choose speeds faster than 1/60th to ensure there is no blurring. However during the first dance I switch between speeds and I prefer slower than 1/10th as this captures the movement in the brides dress as she is swept across the dance floor. AV – Aperture Priority. 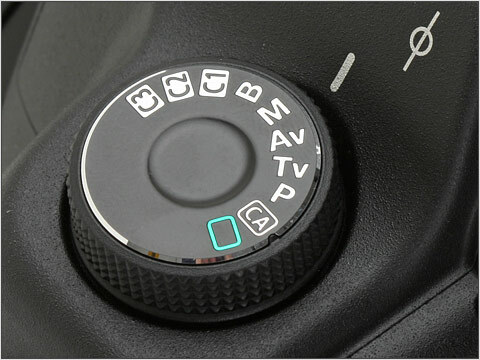 When you select this camera mode, you are instructing the camera which aperture to select. Once again the cameras electronic circuits work out the best shutter speed for a perfect exposure. The most common use of aperture priority is to control the amount of background blur. “At a wedding” – I choose a wide aperture f16 or above to ensure everyone in a group shot is in focus and so is the background. I would chose an aperture of f4 if I wanted to blur the background. M - MANUAL . You set both the shutter speed and the aperture. There is no need to fear this setting. You use the light meter indications inside the camera viewfinder to either expose correctly, or under or over expose as necessary. 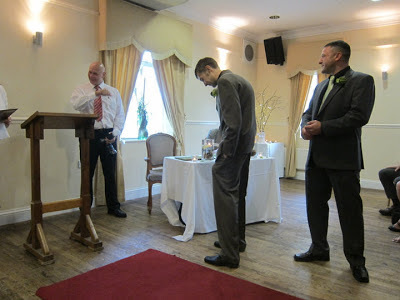 “At a wedding” – I would use manual mode sparingly. Preferring to use either TV or AV. P – Program. If you are a beginner and haven’t got time to work out the best settings for shutter speed and aperture, then please use this mode. The camera adjusts the settings for you automatically. Keep an eye on them though, as shutter speeds can drop down and cause motion blur at lower light levels. “At a wedding” – If I wanted to get a lot of general shots in similar lighting conditions I would use Program. Why? Because sometimes getting “the shot” or “capturing the exact moment” is more important that twiddling knobs! ISO – This is the one important factor, not controlled with the mode knob, but is heavily interlinked with its use. The higher the ISO number the more sensitive the camera senor is to light. So you would choose a higher ISO number when shooting inside a church, for instance. Be careful though, because the higher the ISO the grainier or noisier your pictures become. Try taking a series of pictures at different ISO settings. When things get too noisy, go back a setting and then try not to use the higher settings unless it is a must have shot. Photography either as a professional or as an amateur should be fun. Get out there and experiment, using the different modes and see what effects this has on your pictures. There are still lots of camera clubs about and certainly lots of forums to help you on the internet. Take lots of photographs and do print the ones you like. Photographs look different in print, than on your computer screen. Duncan Malloch has been a keen photographer since the age of 9. At 10 he was taking, developing and printing black and white photos in his own darkroom. In 1984 he shot his first wedding as a professional. Since then he has won awards from the master photographers association and taught photography at a local college. How Will You Choose to Display Your Wedding Memories? Weddings are all about getting that one day right. Everything has to be perfect in every way. This is one of the most important days in an individual’s life. That is why capturing those memories is essential. When planning for a wedding, getting a wedding photographer is one of the most important decisions. You have to get someone who will get those beautiful moments in the best possible way. Besides your memories, photographs are the next best thing that reminds you of that important moment in your life. Hiring a wedding photographer should be done with the uttermost care. You have to find someone who is reliable and dependable. Photographs are all about capturing the moment. That means the location has to be picture perfect, so to speak. 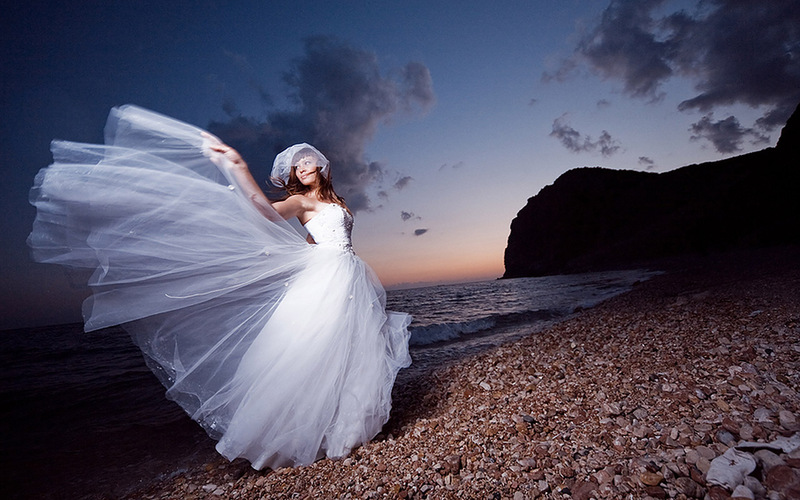 A good photographer will know the best locations to take those wedding photographs. The best part about having photographs of your wedding is that you get to show them off. They are a reminder of the good times. There are a lot of ways that can be used to show off those wedding photographs. With advances in technology, exhibition of photographs has gone to a whole new level. Gone are the days when people had just photo albums to show case their memories. Now there is so much that can be done with photography. So much art can be created from your wedding pictures. Canvas - Printing photos on canvas is one of the ways that you can go with those wedding shots. With this type of medium, the images are printed on an art canvas substrate. This is then wrapped in a frame, or you can choose to hang it as it is. You can get a variety of frames for different photos. Digital Photography - With concepts like digital photography, there are a variety of new ways that photographs can be exhibited. One of them is through wedding slideshow. You can have images of your most precious moments created in one montage to tell a story. Memory Sticks or Pen Drives - You can also have your wedding photographs stored on a memory stick. This means that you can have access to them whenever you want. All you need is a device to view them or print. With a memory stick, you can also upload them to share with friends and family via email or facebook. Mobile Phone - You can also opt to have them in your phone so they go with you wherever you are. iPad or Tablet PC - After the wedding photographs have been taken, you could ask to have them presented to you on a new tablet. This is something that is fairly new and has the added benefit of you having anew iPad!. With your photos on your mobile device, you can see them at a larger size than your phone whenever you want to. You can put one up as wallpaper. This way, you can see it whenever you look at your phone or tablet or computer. It also makes it possible to have your best memories when you travel. Framed Prints - You can also exhibit your wedding photographs in a more traditional way. By having the best photos framed. You can get beautiful frames and display them on your walls. This way, everybody in your house has a chance to see them. One thing is guaranteed, if you get a professional, experienced photographer their skills will deliver you the quality photos you want. Once captured you can have your memories displayed in anyway you choose. With professional wedding photography experience dating back to 1984, Portrait Wedding Photographers are experienced, reliable and easy to get along with. Covering the whole of the UK and taking assignments overseas in areas like Florida, New York, Italy, Cyprus and Dubai. 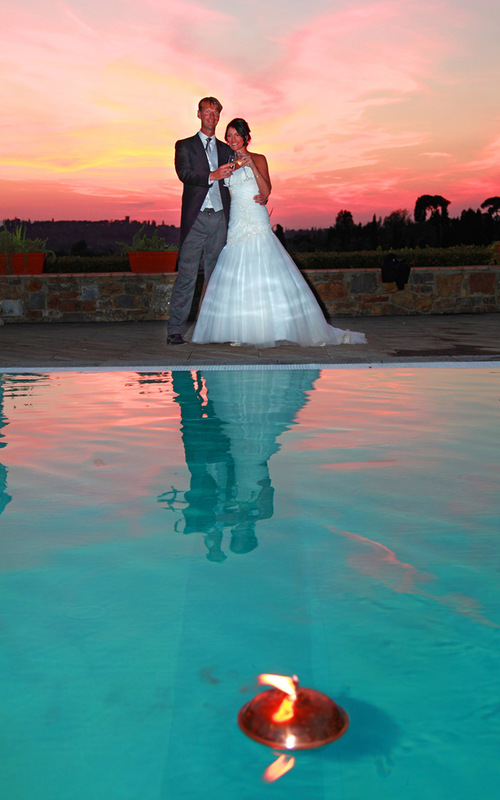 They also only use the best wedding album manufacturers in the world - Graphistudio from Italy. How do you choose a wedding photographer, is a question that has been asked by brides for years and years. The process is made more difficult, because it’s not like buying a car. When you buy a car, you can see it, you can sit in it, have a test drive, feel how it handles, even how it smells. Wedding photography is different. You are investing in something that, yes you can view sample albums, but it’s not your experience. So you don’t know the extras that the service brings. I know photographers that have bought photos from stock libraries to complete an album, and when asked is this all your work, what do you think they say? Errr "of course." But do you know something, something more important than photographs? To be a great wedding photographer the greatest skill you need is to be good with people. Taking pictures is secondary! OMG I hear you say. Let’s think about it some more. Most couples still get married at a church and then go off to some hotel for their reception. The reception provides a wedding coordinator don’t they? But are they with you as you and your Bridesmaids get ready? Are they with you at the church? No they are not. But you know who is....Your wedding photographer! I know that not every Bride wants pictures at her home, getting ready. But a good photographer will insist on being there. Why? Because they want to photograph your wedding inside – out! What do you mean photograph a wedding inside out? I mean that by building up relationships with close family and friends your wedding photographer becomes an insider, not an outsider! This matters because nearly every Bride nowadays wants natural looking photographs at her wedding. Can you see how these beautiful natural photographs are more easily obtained by an insider, a temporary member of your family? By being there at the start of your day a wedding photographer gets to know everyone. Gets to meet Dad and help with his tie and button hole. Takes pictures of the Bridesmaids and can offer advice on how to hold their flowers for the best results. The photographer gets to know the Bride, know what makes her tick, can deflect stressful situations and can get her to smile without asking her too. If everyone is more relaxed do you think you will get better photos? I am of course not saying quality of photographs is unimportant, what I am saying is do you really want to spend the best day of your life with an idiot who tells you to smile all the time? Or with someone who helps you, offers advice and can make you smile or laugh, like a favourite uncle? Whichever wedding photographer you choose, have a fantastic wedding day. Inside out! If you have your big day coming up, there are so many things to be concerned about. While most of these tend to focus on how to make the day a success, there is one thing that will ensure that your memories are remembered forever, your wedding photographs. To ensure that you get blissful memories of your day, most couples prefer to hire the services of expert wedding photographers. Though these services cost, these experts are the best you can get when it comes to capturing those special moments, so it is more of an investment. The knowledge of expert wedding photographers becomes more essential if you are having your wedding in an exotic resort, far from home. Professional photographers have an innate knowledge and experience of wedding venues and variable lighting conditions, and can suggest all the “cool” locations for photographs. With these experts, you are totally assured of professionalism, friendly and personalised services, services that surpass your expectation. 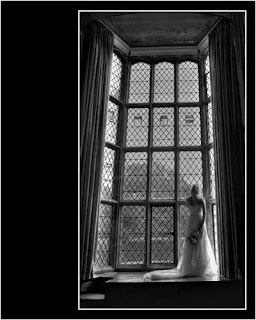 Local wedding photographers with many trusted reviews online should be able to show that they have many years of experience and skill. This is the basic reason why hiring a recommended wedding photographer is key. While this may not seem relevant at first, it will become evident when they start shooting your pictures. The truth is that you need pictures with interesting backdrops not just posed in front of a church. If you hire an expert local photographer, it is most probable that they will know your venue and the best locations to capture your wedding pictures. 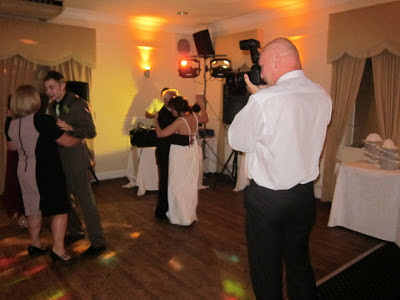 Most expert wedding photographers working locally are immensely “connected” to all other wedding service providers. As you know planning and executing a wedding is no easy task. A local wedding photographer can recommended people like dress suppliers, florists and car hire companies, they know a lot more about weddings than just taking awesome pictures. Through their many years of experience and service, they have gained these contacts and knowledge by being specialists in the wedding business. In the event that you require help with a certain aspect of your wedding, it’s possible that a local photographer will help you out. Remember that through the various reviews on Google local, you can get hold of a professional wedding photographer you can trust. You simply need to see how many reviews there are, then go through them and see what other couples liked about the whole experience. Then it is just a case of feeling if you will be comfortable and enjoy sharing your wedding day experience with your chosen company. Hiring a local expert wedding photographer doesn't have to cost a fortune and you are guaranteed beautiful, ever lasting memories of your wedding! Congratulations! Photographs are the best part of every event. They will live on years and years after any occasion and when the event is your wedding day then no one would want to compromise in capturing their precious moments for the long term. Photographs are the best way to preserve memories and your wedding day is the one that you will want to remember forever. So it is good to hire a professional photographer who documents your special day in a personalized and professional manner. To avoid the disappointment after the event, hire an experienced and professional photographer for your special day in advance and then you can relax knowing you are in safe hands. · Taking perfect pictures are not as easy as it seems. An average person can’t make your pictures spring to life, whereas professionals have experience, skill and artistic eyes to capturing the essence of every event. They are experienced in what they do and they will also ensure your pictures are beautiful. Would your friends or family members have that experience to capture the important moments during your big day. · Professional photographers focus on the bride and groom and people or things that you want to capture as your special moments. If you let your friend to do this, would you end up with exactly what you want? · Remember paid professionals are there to provide you with the best service, give advice and will ensure you have many beautiful wedding photos to treasure. · They have great ideas for unique poses and shots as they have been doing this for years. Your family and friends won’t know how to make you look your best and might miss those special moments, whereas a professional knows when things are going to happen, by instinct. Hiring a professional will ensure you to have unique photos of your best day. · Professional wedding photographers concentrates on their job and will never miss any important moments during your wedding. Many are there from bridal prep to first dance to ensure every moment is there for you to re-live. · They use latest technology and editing software to create special images of your memories. They will capture your images and then give them whole new look that makes your memory book just the way you want it, maybe convert to black and white or add a soft focus effect. · They have multiple album options that simply are not available to anyone other than professional photographers so if you want a really awesome wedding album, there is only one choice. Professional photographers have excellent cameras, lenses and know how to manipulate the light for the best pictures. But overall it is not the equipment but the experience that really counts. A passion for being around people, of knowing what looks fantastic, options to make your album look simply awesome. The best wedding albums are only available to professionals, so really there is only one choice.